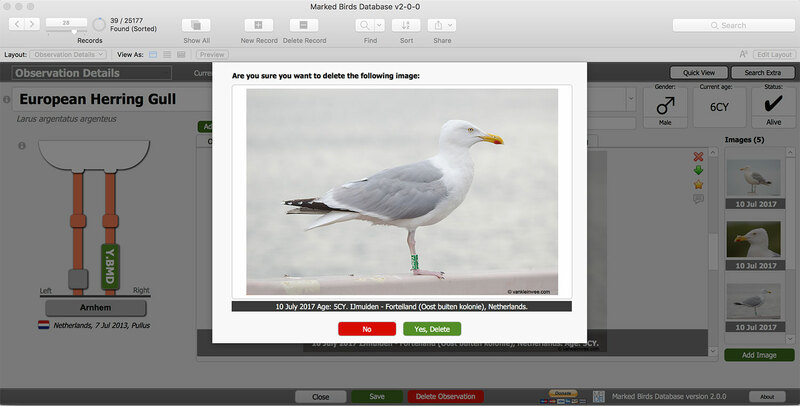 Now that the gull breeding season is over and field work in the colony has stopped, it is time to continue working on the Marked Birds Database again. As announced in my previous post back in March, I am currently working on making the database compatible with FileMaker version 16. This is nearly finished and I am expecting to make this version available around mid-September. 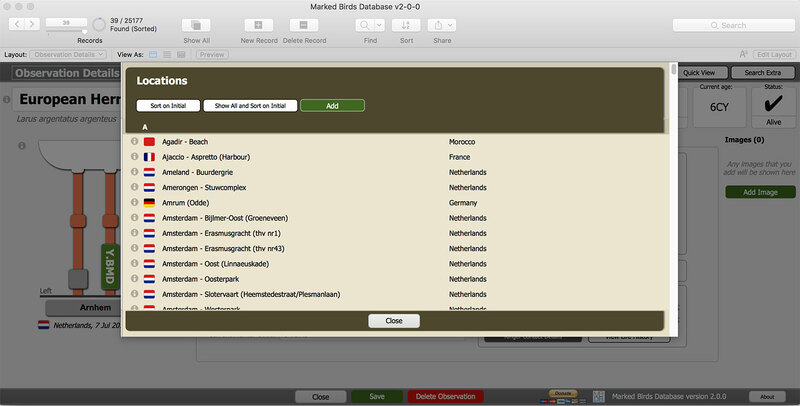 FileMaker 16 introduced a new feature that I can use to make the database more user friendly and efficient. It is called ‘cards’ and is basically a way of placing a layout over another layout. This was already possible but what is different is that the layout on top is fixed in place and that the layout below it cannot be accessed. 1. Display information to briefly view or work with, without losing the place in the database where I’m working at that time. 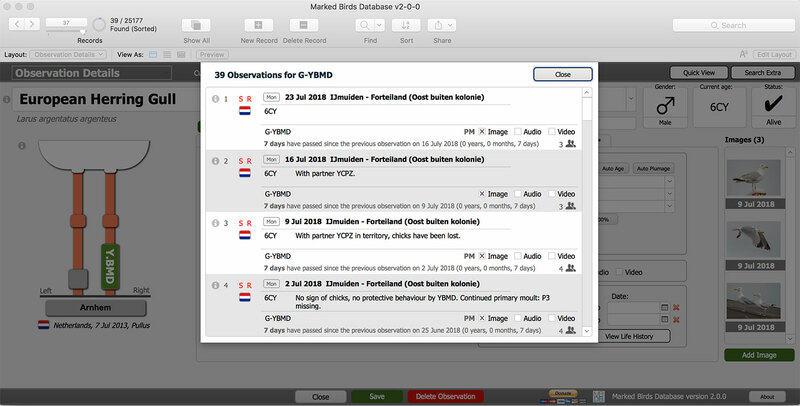 Some of these cards can be found by clicking the new ‘Quick View’ option in the Bird Overview or Observation Details layout, to quickly display the life history, marker events, primary moult, or to view all observations. In the same way, all options of the Manage MBDB menu have also been turned into such cards. 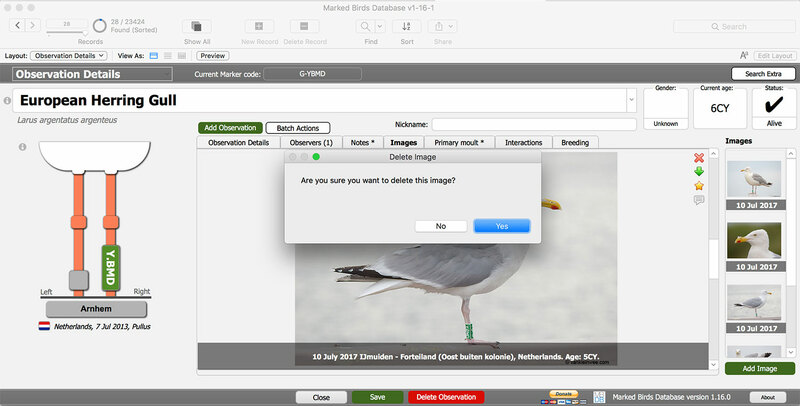 Above: Displaying the life history while working in Bird Overview. Above: Displaying all other observations of a bird while working on one of the bird’s observations in Observation Details. Above: Managing locations while working in Observation Details. 2. As a replacement for messages. Instead of using the default messages (of which the size needs to be manually enlarged if it contains a lot of text), cards allow me to not only include any kind of information that I want to show, but to also display it any way I want and include any kind of object, including images. I can also control the size of the card so that all the information is always visible. Above: The old message for deleting an image. Above: The new message for deleting an image. More detailed information about how this all works will become available when the new version is released. Other small improvements and fixes have also been planned for this new version. Once the new version is fully tested and released in September, work on adding support for wader-type projects (multiple (un)coded rings and flags) will continue. 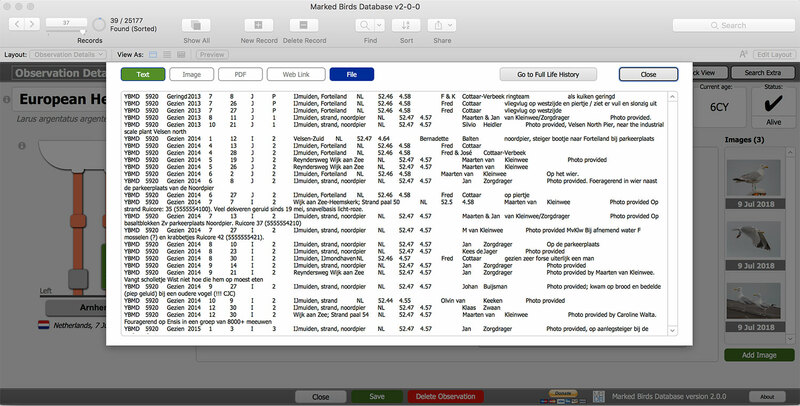 This is done in phases, and next up is Phase 2: BirdRing import – adding birds (wader-type projects). This is quite a big project so I can’t give an exact release date, but for now I’m aiming to have it ready some time in November. We’ll see around that time if this is realistic or not.